Refractive index detection offers a solution in those cases where other detectors, such as UV, do not respond adequately to the compound of interest or where other detectors are not compatible with the mobile phase. Typical applications include sugars, alcohols, aliphatic hydrocarbons, polymers, and silicon oils. 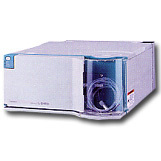 The Model L-2490 Refractive Index (RI) Detector features high sensitivity, excellent baseline stability, and compatibility with other LaChrom Elite HPLC modules for unattended operation. The L-2490 provides digitalized signal output, shorter time for baseline stability, and variable cell temperature settings. Proven Differential RI Design - The L-2490 compares the refractive index (RI) of a sample in the mobile phase to pure mobile phase in a reference cell. This differential measurement method provides excellent sensitivity and compensates for flow cell contamination and fluctuating source energy. The cell temperature is settable in a range of 30 degree C to 50 degree C or to no control. Automation Features - For optimum results it is necessary to periodically purge the reference cell with fresh mobile phase. The L-2490 purge function is controllable from external contact closures for routine purge operations. Baseline auto-zero is also externally controllable. Part of the LaChrom Elite System - The 2490 is stackable forming an integrated, 14-inch wide HPLC system with other LaChrom Elite modules. EZChrom Elite Software accepts data from the L-2490 through a USB interface which also provides for control of other system components like the L-2100 Pump, L-2200 Autosampler, and L-2300 Column Oven. e.g., toluene quinoline, m-cresole, acetone, ethyl acetate, DMF, or DMSO. e.g., polystyrene, polymethacrylate, polyethlene, glycol, polyvinyl alcohol, and starches.